With the 2010 Winter Olympics in Vancouver just over the horizon, Visa has decided to extend its contract with the Olympic Games through 2020. Visa will remain the sole payment services sponsor of Olympic Games. Since 1986 visa has been an official sponsor of the Olympic Games. This will continue at least through 2020. 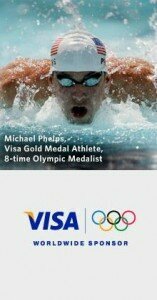 This means Visa has sponsored the Olympics through some of the greatest games ever. Stretching beyond just sponsoring the Olympic games Visa sponsors many Olympic and Paralympic athletes. Visa has provided funding and financial support to help athletes reach their full potential during the games and more importantly during their normal lives. By using your Visa card you are helping support and sponsor team USA for the Olympic Games. Team USA is in no way financially supported by our government, meaning sponsors like Visa and others help fund team USA’s efforts. Good Luck to Team USA and Visa in the 2010 Olympics in Vancouver, Canada. Comerica Bank is giving out a $400 bonus for its small business customers. This is their way of giving your business a stimulus package. This offer is being called the “Comerica Small Business Sensible Stimulus Package”. Unlike most bank bonuses, which require you to sign up for a new banking account, Comerica is giving its bonus to active Comerica business checking accounts. These are people who already have an opened account with the bank. To be active you must have 5 or more customer-initiated transactions per statement cycle. Along with having an active account, you will need to establish a new qualifying account and/or service between October 5 and November 27th, 2009. You can register at Comerica.com/grow by December 8th, 2009 and your participation will begin on the first month after you have registered. You will receive $100 bonus when you subscribe to and use the Comerica Bank Payment Solution Package for 6 months. You will receive another $100 when you use your Comerica Business Check Card an average of 6 or more time each month for 6 months. $50 when you open a new Comerica Business Credit Card. $100 when you sign up for and use Comerica Merchant card processing services (speak to their merchant services to find if you can get a better rate than you currently are). $50 when you sign up for and use Comerica Business Deposit Capture for 6 months. A free 2-year maintenance plan. Qualifying bonus payments will be deposited into your Comerica business checking account about 6 months after your eligibility. You must keep each account open and active for at least 6 consecutive months to qualify. A maximum cash bonus of $400 will be paid per business. Limit one payout per business entity. This program and bonuses ends August 31, 2010. Cash bonus is considered interest and will be reported on IRS form 1099-INT. Learn more about this deal here. After slight increases in August and September long term CD rates (2,3 and 5 year certificates) have reversed course and have headed back down for the month of October. Hopes have been high that the raises in August and September may have marked the end to the spiraling CD rates, but as it stands now long term rates are just barely above the record low we saw in the month of July. The shorter term certificate of deposits have also reversed course albeit not as bad as the long term CD’s. It means not much has changed. The same rules that applied for borrowing back in July and August and still the same as we head into November. The decline in CD rates may not yet have reached its bottom, although hopes are still high that this is merely a short dip and soon the CD rates will rebound and continue to rise. Remember the general rule of thumb: Go short when CD rates are low and you think they’re going to go up, and go long when interest rates are high and you think they’re going to go down. CD Rates are obviously low and we are hoping they will increase. So now may not be the best time to go long. Here you can check out the best CD rates from banks across the country. Interest Checking Accounts may be a great alternative while CD rates are still so low. Interest checking will allow you to have continual access to your money, and still be earning comparable interest to CD accounts.